With the Mi Note 2 turning quite a few heads, images of the upcoming smartphone have surfaced, confirming a few key aspects. 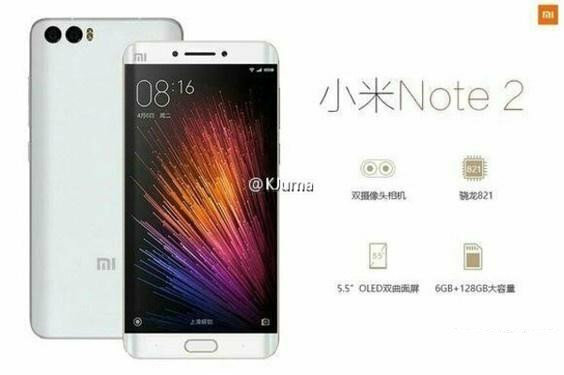 Images of the Xiaomi Mi Note 2 have surfaced online confirming the design and a few specs. The images confirm that the device would have a curved display. Sources suggest that there could be two versions – one with super-high Quad HD resolution and the other with full HD resolution. More importantly, the images confirm the dual camera setup on the back. Also mentioned is the 5.5 inch OLED display. Interestingly, the smartphone is powered by the Qualcomm Snapdragon 821 processor along with 6 GB of RAM and 128 GB of storage. However, we believe that there would be lower storage variant as well.